You’ve no doubt heard the near-constant talk about succession options for retiring advisors. But whether you’re nearing retirement or not, you should be aware that succession planning involves more than valuations, terms of the deal, and buy-sell agreements. Rather, you will need to anticipate what the future business could and should look like. Do you want your firm to continue without you (internal succession), or do you want to sell your business to another firm (external succession)? After all, when it comes to succession options for financial advisors, each approach has its pros and cons. External succession is the transition of one firm to another firm. Within a year or so of selling the practice, the original owner leaves the business, and clients are securely transitioned to another advisor. If a couple of years seems like a long time, consider that external succession generally takes much less time than internal succession. The solo advisor. External succession may be particularly appealing for those of you who wish to remain solo throughout your career and would rather avoid the compromises involved in teaming up with another experienced advisor, not to mention the responsibility of finding, hiring, training, and mentoring a junior advisor. If you simply want to focus on working with your clients rather than managing the business side of your firm, remaining solo, selling your business to an outside firm, and staying in place just long enough to transition clients may be an optimal situation. For the solo advisor, there is something appealing about closing the door and walking away: When it’s over, it’s over. One big pro for solo advisors who choose external succession is that they may receive offers from several eager buyers who are willing to pay full price. While an ensemble firm will likely sell only to another ensemble, a solo advisor can sell to another solo or to an ensemble. Internal succession is the transition to another advisor or advisors within the same firm. It requires finding, hiring, and developing a successor to take your place after you retire, which some advisors may consider a con of this succession option. Finding the right successor. As mentioned earlier, internal succession involves a much longer lead time than external succession. The career development process should begin a decade or more before the senior advisor’s retirement. (It’s important to be aware that things don’t always turn out as expected, and you may need to go through at least one hiring and termination rotation before finding the right successor.) Because of the time they’ve spent working together, the senior advisor and his or her successor tend to be philosophically and operationally aligned, promoting a smooth transition for clients. Apart from the time commitment, another con of internal succession is the lack of fresh talent in the industry. The number of senior advisors anticipating retirement is growing, but there may not be enough junior advisors to go around. Of course, many advisors joke that they plan to stay at the firm “until they drop.” That’s fine—as long as the advisor relinquishes responsibility for running the business to others. Is it right for you? Firms that favor internal succession are typically larger. They continue to grow their top line, and they tend to have well-developed infrastructure and processes in place (e.g., internal career development plans). Keep in mind that discounted valuation is not uncommon in internal succession deals. Whether you anticipate internal or external succession, keeping your name on the door may only be an illusion of a legacy if everything changes once you’re gone. You must decide what’s right for your practice and for your life. Remember, the strength of your legacy will have less to do with your firm’s branding than with the quality of the relationships you have developed throughout your career. 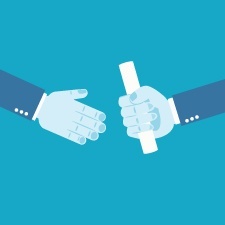 Which type of succession plan do you plan to pursue for your practice? Are there enough junior advisors to fill the gap left by retiring advisors? Please share your thoughts with us below! This post originally appeared on the InvestmentNews website in March 2014.